Bed sores, or decubitus ulcers, represent one of the three most common nursing home-acquired injuries. Individuals with loved ones in nursing home care must take care to stay informed regarding the formation, prevention, and treatment of bed sores to ensure nursing home staff take the proper precautions. Included is a brief overview of how bed sores form, patients who may be at risk for developing bed sores, and why turning and repositioning bedridden patients is an effective means of preventing bed sores. How do Bed Sores Form? Bed sores result primarily from a patient remaining in one position for an extended period of time. The resulting pressure on common pressure points over bony prominences such as heels, knees, elbows, hips, the tailbone, shoulders, and head, compresses capillaries and restricts blood flow to the surrounding tissues. Reduced blood flow decreases the amount of oxygen and nutrients that reach the area and can cause starving tissue to break down and die. When open sores are inadequately dressed, or allowed to otherwise contact surrounding surfaces, re-injury and secondary infection is common. Sanitation of hands, bed linens, other surfaces, and the surrounding skin is important to prevent sepsis or cellulitis from occurring. Unfortunately, staff do not always follow such precautions, putting patients at risk for potentially deadly infection. Is bedridden or wheelchair-bound. Immobility, regardless of cause, renders the patient unable to remove pressure from areas vulnerable to bed sores on their own. In addition, friction and shear from surrounding materials and devices can exacerbate existing issues in fragile tissue. Lacks sensation in any part of their body due to stroke, spinal cord, or other injury. The inability to sense irritation, discomfort and pain prevents patients from sensing oncoming bed sores and their underlying causes before they become severe. Staff and family must pay careful attention in these cases to monitor for injury. Is dehydrated or has poor nutrition. Breakdown of tissues affected by bed sores can be hastened in malnourished skin, speeding the onset of bed sores and preventing existing sores from healing. Has prior circulation concerns. Existing conditions that negatively affect blood flow, such as diabetes, have already limited oxygen and nutrients to bed sore prone areas. Patients with these and other risk factors are especially susceptible to bed sores. Sores can develop rapidly, especially in the presence of several risk factors, and progression through the stages of bed sore severity can take as little as a day. How Can Repositioning Prevent Bed Sores? Adequate repositioning has long been accepted as an effective means of preventing bed sores. Repositioning removes pressure from affected areas of the body and redistributes it to unaffected areas, allowing the capillaries to provide proper blood and oxygen flow to the area once again. This prevents the breakdown and death of fragile tissue, allowing the skin to remain intact. However, the question remains – how much repositioning is considered adequate? The answer depends on the individual patient. Nursing home and hospital standard protocol calls for turning a patient at least once every two hours. Patients with excessively fragile skin, however, may not tolerate this degree of handling. In addition, patients retaining mobility may be able to move themselves sufficiently to reduce manual turning by nursing home staff. Finally, other patients may suffer pain or discomfort from being turned, resulting in a staff weighing the risks of turning the patient against the benefit provided the patient. John Maynard, manager of ostomy and wound care at Shield Health, recommends beginning with moving the patient every two hours, then determining their tolerance for remaining in one position within that time frame. If an area is frequently red upon moving, he recommends staff reduce the amount of time by 30 minutes. Individuals with loved ones in nursing home and hospital care should keep these guidelines in mind and inquire about the turning schedule in the facility responsible. 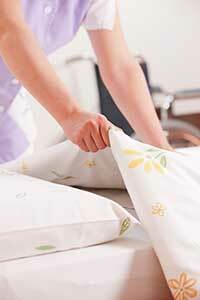 Turning and repositioning is the most important step toward preventing bed sores before they begin. Vigilant staff, patients, and loved ones can work together to ensure that a patient is moved sufficiently to encourage circulation throughout the patient’s skin. Preventing bed sores before they begin eliminates the risk of open wound infection, and drastically improves the quality of life of the patient regardless of where care is provided.